I’ve been pursuing this concept for a few years now and I’m using my compositions to help me master it. By getting this into my playing it will allow me to improv and compose on multiple time levels which really sounds great –when you can do it. 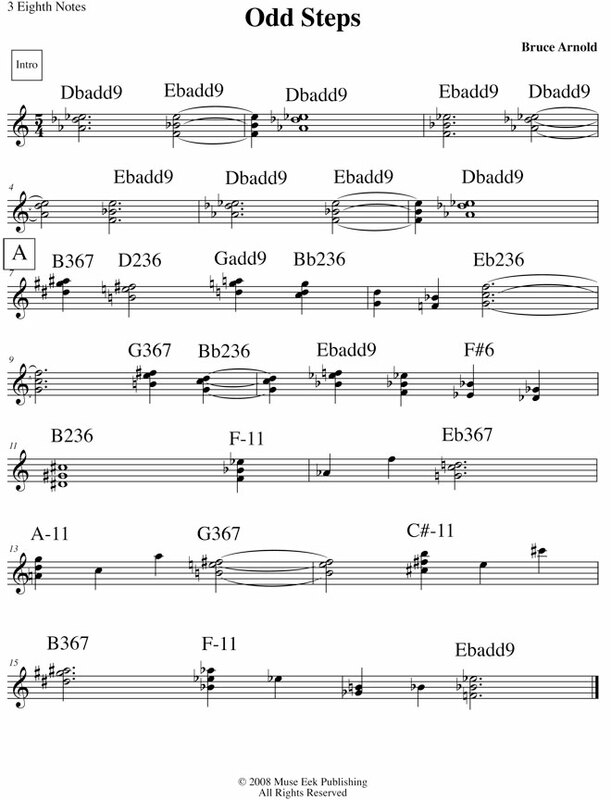 The composition below is a variation on Giant Steps. You will notice the melody is moving rhythmically in groups of three eighth notes. This allows the melody to be accompanied in two rhythmic levels fairly easily. Below is how the regular time translates into the three eighth note level. It’s a little tricky moving between the two levels because the three eighth notes cycle doesn’t start in the first measure; it starts in the second measure, so you’ll notice that the three eighth notes page starts on the second measure of the piece. To make this work at the three eighth note level you have to read the 1st measure of the regular time as three beats then jump to the three eighths page and continue from there. 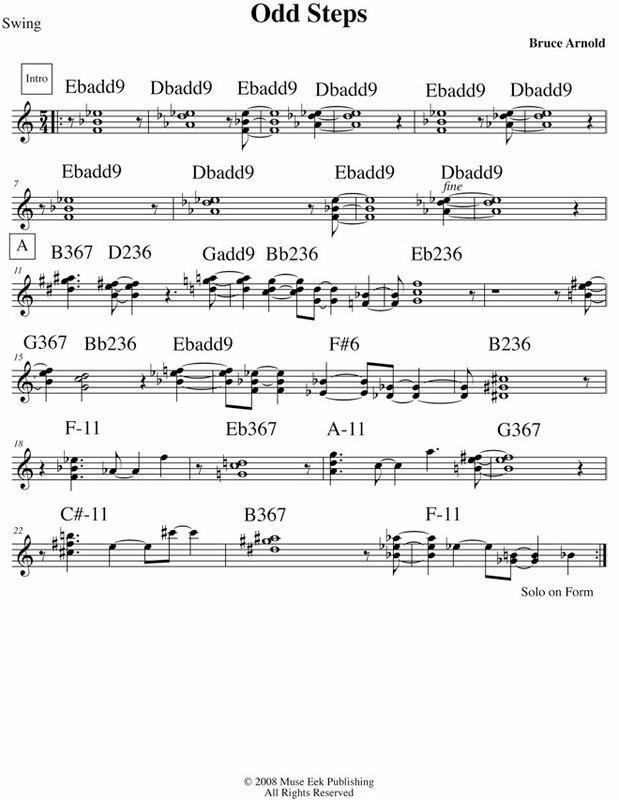 If you want to give this a try you can use the metronome file below which first plays the regular time page giving you one click per beat and then plays the piece in three eighth notes of time as seen on the 2nd page. Also when coming back from the three eighth note level chart you have to jump to the 2nd measure of the regular time chart. There is a bunch of other stuff going on in this chart. A quick summary would be I’m using “027” chords for the melody. “027” would be a whole step and a fifth. In order to keep this sound consistent you’ll notice some rather unorthodox chord symbols. I also solo with “027” which will be a subject for another post. Another option would be to notate all the strange ones as slash sus chords. (That is, after all, what the 027 chord is: in its inversions, sus2, sus4, or stacked fourths.) Your way would keep the guitarist more acutely aware of the bass line, though, I guess. Way cool. I can’t wait to get my hands on my guitar later. I did just a bit of metronome practice just now and I could feel it grooving even at a slow tempo. It’s interesting to think of it also as 10 against 15 – e.g., 10 equal pulses against one bar of 15/4. Then each of the 10 pulses can be sung as triplets (Ta-ki-ta), or some other variation. Nice to hear from you and thanks for the suggestion. I’ve actually used slash chords or other types of chord notation in other charts. Since Giant Steps is so well known by musicians I thought I’d try a new approach of just including the bass note plus the degrees. So far people find it OK. I’ll post an example of an earlier piece where I’m using different chord spellings so you can see what I’m talking about. Thanks for your comment and hope you can keep interacting. Yep it’s fun to work back and forth with the levels. Tony Moreno, Dean Johnson and myself also work on playing one level while soloing in the other. Tony often interjects different feels and time levels where ever he feel it musically appropriate. For instance he might play a double time groove on either of these levels. The possibilities are endless and it really challenges your sense of time. I am currently working through your music theory books. I just found the file you wrote called Applying Music Theory in the Member’s Section. All of it is clear to me, except for the section on hexatonic scales. What I understand is that you are combining two triads, tertial or non-tertial. The number of half steps in the triads between the notes are how you end up at the interval notation. For instance, on page 14, you show two add9 triads (Cadd9 and Ebadd9). Then you combine the notes, which results in a six note scale. What you end up with are the notes C, Eb, F, G, A, and Bb. Isn’t this essentially part of a C Dorian scale? Outside of the fact that the note D is missing, I feel like I am missing something. and yes both would be part of a dorian scale minus one note. This also makes it a power replacement both for chords and melody for anyplace you use a dorian scale. The Sonic Resource Guide (Digital Edition) would give you all the possible ways you could make 3 note groupings from the notes C, D, Eb, F, G, Bb. So just think of this in the Key of F for it’s application to Major or D Minor for it’s application to Dorian. This page will also list all the 3 and 4 note chord possibilities for the 6 note set along with all the traditional chords that you could play this set over in all keys. PS Both the digital and physical editions of the Sonic Resource Guide are the same. I listed links for both because if your not in the USA the digital versions is by far the better value. It’s a big book weighing in at 702 pages so it’s expensive to ship overseas. But it gives you all possible scales and ton’s of information about how to apply each in many ways.